Where do those crazy story ideas come from? New York Times bestselling indie sensation A. Meredith Walters dishes on how she got the idea for her searing, raw novel FIND YOU IN THE DARK, out today for the first time in print from Gallery Books! Be sure to pick up a copy, and stay tuned for the sequel, LIGHT IN THE SHADOWS, out July 15th! It’s the writer’s best friend. It can be elusive or it can smack you in the face at the strangest times. I’ve been asked over and over again; where do you get the ideas for your books? And I can honestly say that they came to me, literally out of nowhere. 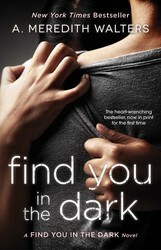 The concept for Find You in the Dark struck when I was in the bathroom. Yes, you heard that right. I was getting a shower and my mind wandered, as it does, and Clay sort of snuck up on me. When I wrote Find You in the Dark I was working as a Behavioral Specialist with children suffering from significant mental health issues. One particular client I had been working with for over four years and I had seen every extreme in his behavior as we worked together to control his destructive impulses. I often wondered what this young boy would be like when he was older. What challenges he’d face being labeled with his particular diagnosis. He too suffered from Borderline Personality Disorder and while he wasn’t bipolar, he was self-injurious, just like Clay. So there I was, in the shower, thinking about different therapies I could use with this young man and Find You in the Dark hit me like a ton of bricks. It would be a story about a young man who suffered from a mental illness and all of the struggles he faced in his journey for, what he considered, a “normal” life. It became mixed together with my real life and everything I was doing to try and help my client. It grew. It took root. It became it’s own being. I think I outlined the whole thing in the time it took me to rinse my hair. My ideas come to me like that. Some are based on experiences from my life. Like Find You in the Dark, my first New Adult novel Bad Rep was loosely based on my own experiences. In that case it was a situation I found myself in while at college. Other stories like my newest novel, Lead Me Not, which will be released by Gallery Books in August, was the result of a twisted vision in my head. An amalgamation of thoughts and ideas that eventually become the story. It began with a random conversation with my husband and exploded into the tale of Aubrey and Maxx. Sometimes the ideas come easily. Sometimes it’s like pulling teeth. Writer’s block is a very real, very scary thing for an author. There is nothing worse than staring at your computer, willing the words to flow and coming up empty. I go through weeks, sometimes months, where I can’t write a thing. But when it hits, it’s like a flood, and no one can tear me away from the keyboard. And that’s what happened when Clay and Maggie from Find You in the Dark crept into my brain. They burrowed deep and made their home there. And even now, almost three years after writing their story, I still like to revisit them from time to time and think about how their life ended up. They get tangled up with new characters and new plots on a daily basis. And I usually think of these ideas at the most inconvenient times…like when I’m driving my daughter to school or doing the grocery shopping. But inspiration is like that.